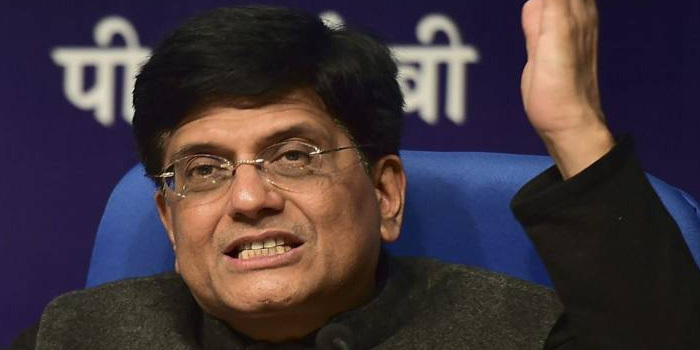 Finance Minister Piyush Goyal in his Budget 2019 speech on February 1, 2019. The budget, the last before April-May Lok Sabha election. I rise to present the Interim Budget for the year 2019-20. I am deeply conscious of the absence of Shri Arun Jaitley today. I am sure the House joins me in wishing Arun Jaitley speedy recovery, good health and a long life in the service of the nation. Madam Speaker, past five years have seen massive scale up of health care. Earlier, a poor man used to be in dilemma whether to fulfill daily needs of the family or save the life of an ailing member. This situation has deeply pained our Hon’ble Prime Minister. We launched the world’s largest healthcare programme, Ayushman Bharat, to provide medical treatment to nearly 50 crore people. Already close to 10 lakh patients have benefited for medical treatment which would have cost them ` 3,000 crore through free treatment made available under the scheme. Lakhs of poor and middle class people are also benefiting from reduction in the prices of essential medicines, cardiac stents and knee implants, and availability of medicines at affordable prices through Pradhan Mantri Jan Aushadhi Kendras. paid during this year itself. This programme will entail an annual expenditure of Rs 75,000 crore. PM-KISAN would not only provide assured supplemental income to the most vulnerable farmer families, but would also meet their emergent needs especially before the harvest season. PM-KISAN would pave theway for the farmers to earn and live a respectable living. crore in the current year itself. I announce setting up of “Rashtriya Kamdhenu Aayog” to upscale sustainable genetic up-gradation of cow resources and to enhance production and productivity of cows. The Aayog will also look after effective implementation of laws and welfare schemes for cows. Maximum ceiling of the bonus given to the labourers has been increased from Rs 3,500 pm to Rs 7,000 pm and the maximum ceiling of the pay has been increased from Rs 10,000 pm to Rs 21,000 pm. The ceiling of payment of gratuity has been enhanced from Rs 10 lakhs to Rs 20 lakhs. During the last five years the minimum wages of labourers of the all categories have been increased by 42%, which is the highest ever. The ceiling of ESI’s eligibility cover has been increased from Rs 15,000 pm to Rs 21,000 pm. Minimum pension for every labourer has been fixed at Rs 1,000 per month. In the event of death of a labourer during service, the amount to be paid by EPFO has been enhanced from Rs 2.5 lakh to Rs 6 lakh. Domestic workers are also engaged in big numbers. We must provide them comprehensive social security coverage for their old age. Therefore, in addition to the health coverage provided under ‘Ayushman Bharat’ and life & disability coverage provided under ‘Pradhan Mantri Jeevan Jyoti Bima Yojana’ and ‘Pradhan Mantri Suraksha Bima Yojana’, our Government proposes to launch a mega pension yojana namely ‘Pradhan Mantri Shram-Yogi Maandhan’ for the unorganised sector workers with monthly income up to Rs 15,000. This pension yojana shall provide them an assured monthly pension of ` 3,000 from the age of 60 years on a monthly contribution of a small affordable amount during their working age. An unorganised sector worker joining pension yojana at the age of 29 years will have to contribute only Rs 100 per month until the age of 60 years. A worker joining the pension yojana at 18 years, will have to contribute as little as Rs 55 per month only. The Government will deposit equal matching share in the pension account of the worker every month. It is expected that at least 10 crore labourers and workers in the unorganised sector will avail the benefit of ‘Pradhan Mantri Shram-Yogi Maandhan’ within next five years making it one of the largest pension schemes of the world. A sum of `500 crore has been allocated for the Scheme. Additional funds will be provided as needed. The scheme will also be implemented from the current year. Women’s development to women led development. In order to take the benefits of Artificial Intelligence and related technologies to the people, a National Programme on ‘Artificial Intelligence’ has been envisaged by our Government. This would be catalysed by the establishment of the National Centre on Artificial Intelligence as a hub along with Centres of Excellence. Nine priority areas have been identified. Infrastructure is the backbone of any nation’s development andquality of life. Whether it is highways or railways or airways or even digi-12 ways, we have gone beyond incremental growth to attain transformative achievements. comprehensive digitalization of export/import transactions and leveraging RFID technology to improve export logistics. Demonetisation and Drive against Black Money 67. Our Government is committed to eliminating the ills of black money from our country. The anti-black money measures taken by us during the last four and half years in the form of Black Money Law, the Fugitive Criminal Offenders Act, and Demonetisation, have broughtundisclosed income of about Rs 1,30,000 crore to tax, led to seizure and attachment of assets worth approximately Rs 50,000 crore, and compelled holders of large cash currency to disclose their source of earnings. During this period, Benami assets worth Rs 6,900 crore and foreign assets worth Rs 1,600 crore have been attached. As many as 3,38,000 shell companies have been detected and de-registered, and their directors disqualified.Growth of 18% in direct tax collection in 2017-18 and increase in tax base by as many as 1.06 crore people filing income tax returns for the first time in FY 2017-18 is mainly on account of demonetization.